Your Newest Customers, Millennials, Are Changing Up the Car Buying Process. So Where Should You Focus Your Efforts? Millennials optimize the online car buying process more than any previous consumers. What does this mean for dealers? It’s no secret to car dealers that the process of car selling is ever-changing. Besides the evolution of automobiles themselves, there is also another important factor changing in the industry—the customer. As the largest call tracking company in the world and having worked with auto dealerships for over 20 years, CallSource sees all the trends in the automotive marketing space—so you can say we know a thing or two about it. It is important to not only focus on the car selling process but the car buying process that your consumers are experiencing. And while it may or not be surprising for dealerships, millennials (people born between 1981 and 1997) are making up a bigger customer-base than you may have previously thought. Seriously –AutoRaptor reports that as of April 2016, millennials are the largest living generation in America. The question that remains is: where should you be focusing your marketing and selling efforts to most effectively meet your sales quotas and your millennial customers’ needs? The answer, of course, can be found online. Quite literally—I mean the answer is the internet. 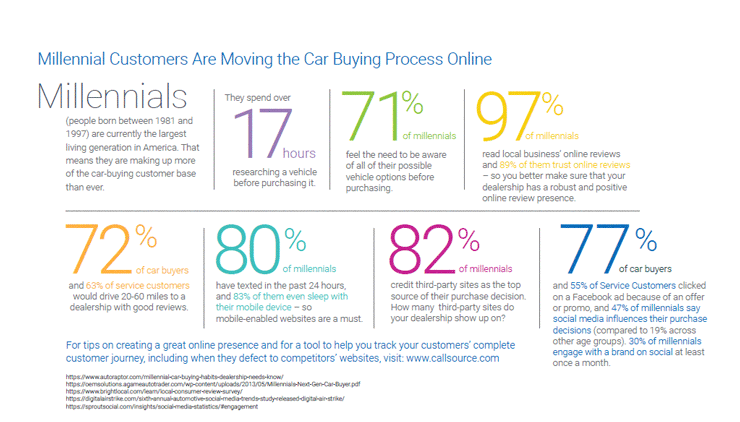 You need to focus more on your online process and the online car buying journey. OK, focusing a bit more on your online efforts probably isn’t any groundbreaking news for you – but I want to make sure that you understand the significance. Having a website isn’t enough; there are many facets of the online experience that you need to pay attention to, especially when it’s reported that millennials spend over 17 hours researching their vehicle before purchasing it, and 71% of them need to be aware of all of their possible vehicle options. These two stats combined show that they are obviously perusing many other sites other than your own, so you need to make sure that your dealership stands out online, and that doesn’t only include your website. How do you do this? Click image to view Infographic PDF. I’ve said it before, and I’ll say it again—you need to focus on your online review presence! This is even more vital when attracting millennial customers, who are more likely to read and write online reviews. Still not convinced that you need to spend more time on reputation management? This statistic may change your mind. BrightLocal reports that 97% of millennials read local business’ online reviews and 89% of them trust online reviews. That means a better online review presence may make the difference between winning or losing a customer. Don’t think that just because you may be in the closest proximity to customers that they’ll choose you for convenience—Digital Air Strike’s Sixth Annual Automotive Social Media Trends study for 2017 reports that 72% of car buyers and 63% of service customers would drive 20-60 miles to a dealership with good reviews. Don’t you think that’s worth striving for? It’s evident in this internet-era that people just don’t have quite the attention span you may be hoping for. Most of us are guilty of being attached at the hip with our smartphones; it’s a device that millennials are using when doing some of their online research. Sad as I am to report this, according to AutoRaptor, 80% of millennials have texted in the past 24 hours, and 83% of them even sleep with their mobile device. This is why you need to be sure to have a great mobile-enabled website, as well as tech-savvy smartphone capabilities such as text alerts, click-to-call, and app integrations. Don’t know if you have a mobile friendly site? Check out Google’s Mobile-Friendly Test. It’s a free mobile evaluation tool. Friends and family used to be the biggest influencing factor in making a large purchase such as a car, but the internet now wins again. AutoTrader reports that 82% of millennials credit third-party sites as the top source of their purchase decision. Keep this in mind and keep up with the times – accepting an app such as AutoGravity, which lets consumers search local dealerships and apply for car financing right then and there, gives a convenience that may be the tipping point for a millennial’s decision of where to buy a car. I don’t want to say that millennials are more flashy than their Baby Boomer parents but…I’m going to say it, they’re more flashy. When you can show off everything you have in a few clicks to a social media site, how can you blame them? According to AutoTrader’s study, Millennials care about owning the best brand and are willing to pay more for a product that fits with their image. Marketers and salespeople know that achieving a sales lead is no time to be modest – show off on your website what features your dealership has that makes you the best and put your vehicles’ special features in the forefront when listing cars. You know that millennials are going to do a deep dive into figuring out all that they can anyway, why not deliver it all up front? You better believe that some of millennials’ online research will lead them to social channels. If you aren’t present there, it can be catastrophic for your dealership. The truth is, they might not even find you to begin with if you aren’t present on social media. Digital Air Strike reported that 77% of car buyers and 55% of Service Customers clicked on a Facebook ad because of an offer or promo, and a recent report by Deloitte found that 47% of millennials say social media influences their purchase decisions (compared to 19% across other age groups). Where are you advertising? Social media isn’t only for gaining new customers, though. You should be using your social channels to regularly communicate with your audiences, especially if someone directly communicates with you via these platforms. Sprout Social reports that 30% of millennials engage with a brand on social at least once a month, but also—89% of social media messages to brands go ignored. Yet, the top choice for a customer care channel is social media. Don’t be a part of this disconnect—use social media to your advantage in marketing and customer service. It’s evident in this internet-era that people just don’t have quite the attention span you may be hoping for. And when, as we mentioned, millennials are spending over 17 hours doing their car research before buying—it’s important to get their attention back to your dealership. Responding quickly to online chats, tweets, or whatever digital way your consumer is interacting with you is imperative. Do you know how your social chat feature on your website is doing? How about the number of consumers who are visiting your website and then leaving to visit another dealer’s site? Well, with Digital AI powered by AutoID, you can see these stats and more. With this newest product, you can see transcripts of online chats, which cars your consumers are viewing, and how many are defected to competitor sites—all in one easy dashboard. So what are you waiting for? Get working on your online presence and start selling to your largest pool of customers! The millennials are waiting for it. I agree that it would help a dealership be more visible to potential clients if they were to have a greater and more regular online presence. However, I think that it would be best to also focus on the coaching of the salespeople at a dealership as well. This is because I would prefer to purchase a car after seeing it in person and test driving it.